In a small saucepan over medium heat, stir together water and sugar until sugar dissolves. Bring to a simmer. Add mint leaves and simmer 2-3 minutes. Remove from heat. Let cool entirely. Remove mint leaves. Store in an airtight, glass container for up to 2 weeks. 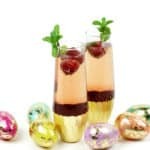 To a champagne flute, add mint simple syrup and creme de cassis. Top with champagne. Garnish with a mint sprig and raspberries.